Take center stage, as an acting veterinarian, while joining our marine mammal trainers dockside during a segment in one of our dolphin shows. 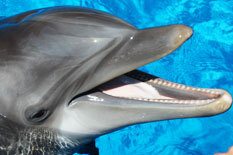 This experience includes the opportunity to touch and feed a dolphin! For more information, see our requirements, policies, and FAQ links. Expedite your check in process by printing and completing this Encounter Participant Waiver prior to your visit. Separate waiver required for each participant. 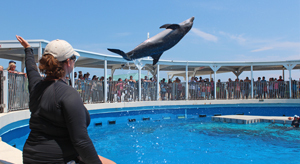 Gulfarium Marine Adventure Park makes every effort to make your visit a memorable one. If you or a family member has any special needs, please fill out our special needs form prior to reserving your encounter, so that we can provide assistance. 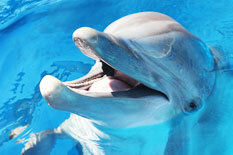 Guests must be age five (5) or older to participate in the Dolphin Star encounter. Participants with special needs including mobility, seeing, or hearing impairments must contact Gulfarium Marine Adventure Park prior to reserving the encounter. Encounter must be paid in full at the time of reservation. Encounters continue rain or shine, no refunds or exchanges due to inclement weather. 24-hour notice must be given in order to receive a full refund of the purchase price. In the event that an encounter must be rescheduled within 24 hours prior to the encounter start time, or after a missed encounter, a rebooking fee of 25% of the encounter purchase price will be applied. Rebooking is subject to program availability and is not guaranteed. Cameras/phones are not allowed into animal enclosures or on docks as participants’ hands must be free to interact with the animals. Family and friends are welcome to take photos from general admission viewing areas. For the safety of the animals, remove jewelry and loose articles from pockets prior to the start of the encounter. Will I get to touch the dolphins? 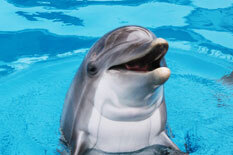 Yes, the Dolphin Star program includes the opportunity to discover how a dolphin feels. What else will I get to do with the dolphins? 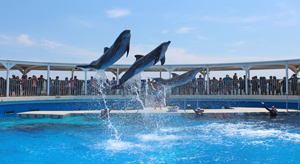 Although each program is different in order to incorporate variety for the animals, the program may include feeding and giving various behavior signals while interacting with the dolphins. Will I go in the water with the dolphins? No, the Dolphin Star program occurs from the dry dock area alongside the habitat. Mats will be provided for each guest to kneel or sit on the dock. Can I take photos during my encounter? Cameras/phones are not allowed into animal enclosures or on docks as participants’ hands must be free to interact with the animals. Family and friends are welcome to take photos from viewing areas. My child is four years old, can they participate? No, participants must be at least five (5) years of age. Does the encounter price include general admission? 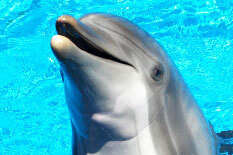 No, the Dolphin Star program does not include the price of general admission. General admission must be purchased separately. Can I get a refund if it is raining on the day of my encounter? Can I get a refund if I need to cancel my reservation? 24-hour notice must be given in order to receive a full refund of the purchase price. Call 850-243-9046 for assistance. Can I reschedule my encounter for a different day if something comes up? What if I miss my scheduled encounter? If more than 24 hours notice is given, an encounter can be rescheduled at no charge. Rescheduling is subject to program availability and is not guaranteed. In the event that an encounter must be rescheduled within the 24-hour window prior to the encounter start time, or after a missed encounter, a rebooking fee of 25% of the encounter purchase price will be applied. Call 850-243-9046 for assistance.